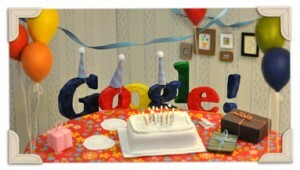 Happy Birthday Google! According to Google’s homepage logo today, Google has officially turned 13. That got me thinking, what would happen to Google if it actually started acting like a teenager? Results about girls would be given a significant ranking boost. The homepage design would be a different background color every week. teh s34rch rslts wuld luk lyk dis. did you mean.. suggestions would be replaced by OMG NOOB!!11!! lrn2 spell. Instead of a captcha for too many searches, Google would require you to drive it to the mall. Google would over-react to rejected buyout offers with thoughts of bankruptcy. The length of results returned would suddenly increase, almost overnight. It would constantly be trying to act like the older, more mature Yahoo – while wanting nothing to do with the younger Bing. Senators would be grandstanding about protecting the Google. Leave your suggestions in the comments and I’ll update this post with the best ones. As a dad of three monsters who turn geekier day by day, I could imagine new products like ‘search by SMS / tweet / FB update’ or an extension to checkout/wallet that allows kids to impersonate their parents for example. Also, Google Games is a must have.